Have you wondered if you can color stamped images with markers that are not alcohol-based? Waffle Flower and Tombow recently sent me some stamps and markers to play with and I am loving the results! 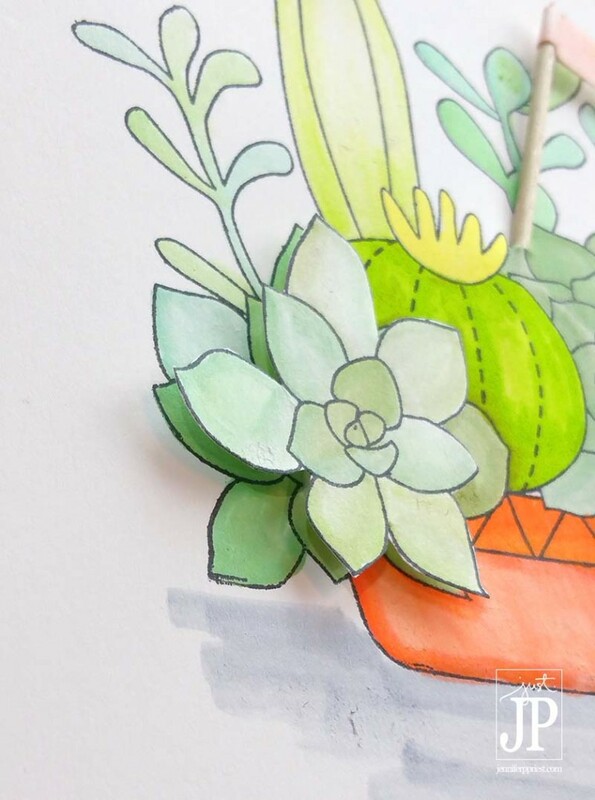 Using a combination of the Tombow Blender Pen and Tombow's Dual Brush Pens, I was able to achieve dimensional coloring on this gorgeous succulent stamped image. By using the Blender, I was able to get a very light look to the leaves and cacti in this image, giving them a more realistic look. To get the color onto the Palette, simply “color” it on, as if scribbling on a piece of paper. To get a rough look to the paper, keep coloring until the paper pills up onto itself. If you don't want the paper to pill, don't color as intensely and allow the paper to dry before adding more color. For even more dimension, I stamped a second image, colored portions of it with the Tombow Dual Brush Pens, and then cut out the portions and mounted them to the card using Tombow Foam Tape. For the flag, I stamped a sentiment onto a scrap of white paper, colored it with a Tombow Dual Brush Pen for a little color, added Tombow Xtreme Adhesive to the back, and wrapped the strip around a toothpick to make a flag. I punched a hole in the card with a pair of scissors and slid the toothpick into the front of the card. What a beautifully colored images, the markers indeed give a water color effect. WOW Jennifer, your card is beautiful. (I guess I need Tombow markers! And I didn’t know they had a blender pen???) Thanks for sharing this! The coloring is so pretty and smooth! Loved the whole effect of the card. Perfect card to go with a gift! I love succulents! I have this stamp set on my wish list. What a fun way to color them in and send on a card! I will also start following you on Instagram. I just started using it and it’s just for crafty inspirtation! LOVE the succulents and the 3d element!! Thx for the vid! Your video makes it look so easy! I hope to find the Dual Brush Pens soon so I can play with them. Beautiful colors….I love the layered part to add dimension. I love your card! I have become obsessed with succulents recently. FUN FLIPAGRAM! Lovely dimension on your card. Thank you for sharing with us, Jennifer. Your creation is beautiful. 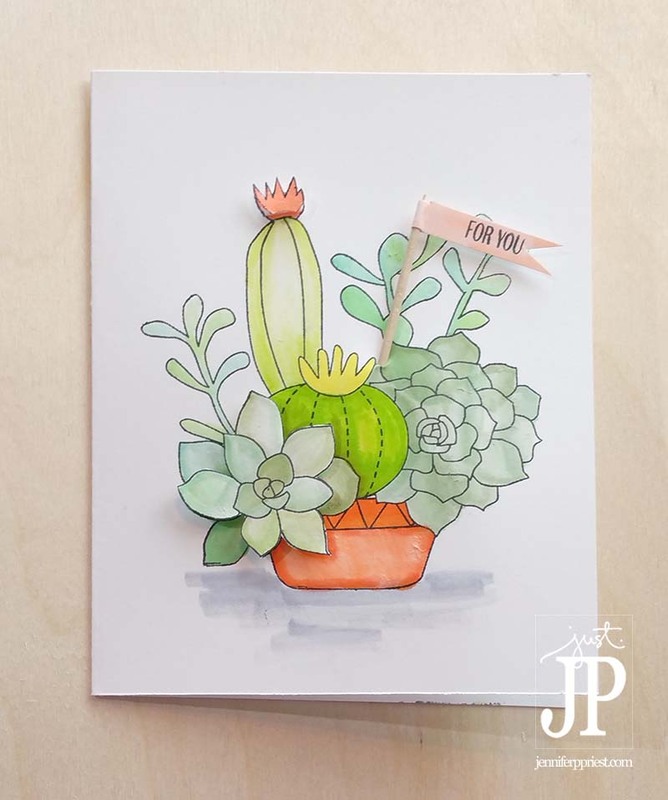 What a great card, especially now when succulents are all the rage. Love the cacti. Wonderful card. Wonderful card. The Tombow markers have such vivid colors and the stamp set is one of my favorite. Love your coloring and how terrific your card came out!! Great tutorial! What a gorgeous card!! Love your coloring! Love the coloring, and your style. Thanks for sharing. I love the shading on the card. Popping parts of it off the card always makes a better card. Would love to try these pens. They seem to be doing a great job on all of the posts. Spectacular coloring techniques!!! What a lovely succulent arrangement. Wow, the 3d effect is awesome! Oh, Oh, WOW – so gorgeously done – your coloring looks so amazing and I love that you used both products in the project!! Just so superbly done!!! Wonderful coloring of these succulents. I like the dimension too. Great card! I loved how the flipagram showed a peek at your process. I really need to learn how to use markers better. I like the soft look of the TomBow Brush pens. Adding them to my wishlist. Oh these are colored perfectly! Love it! There are days I wish I was more artsy. Such a cool concept. This project came out so nice. I love the colors you chose. What a great giveaway. Thanks for sharing! That flower project is pretty! I’ll have to check out that blog hop! So pretty! I love the 3-D look you created. 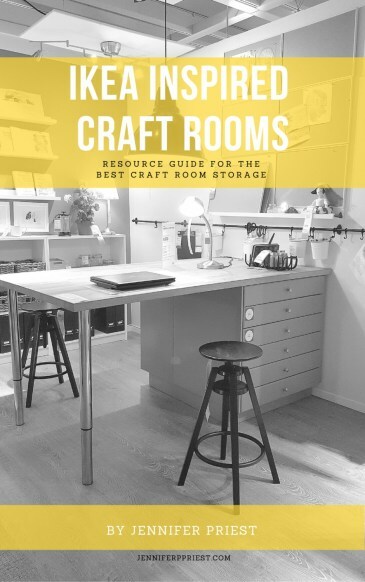 Will definitely be adding these to my crafting want list! Thanks for sharing! The project turned out beautifully! This is such a cute card! I’ve always wanted to try making cards but I am afraid I don’t have enough patience to make it happen! Thanks so much! I don’t have patience either. This way of coloring is pretty quick and it’s just one stamp and one layer 😉 Thanks for visiting! This is a super cute card! I love the watercolor technique you used! OMG!! I need these markers! Love your vid and the sweet card you made. These stamps are darling. I love everything succulent-related!! Love your card Jennifer. Thanks for the tips on coloring with the Tombow markers. I have to admit that I’ve been a bit afraid to try coloring with markers, but you’ve shown how easy it can be.